It's Sunday night. Which means tomorrow is Monday. I don't know anyone who is particularly fond of the first day of the work week, but if you get on it (and I mean now), you may have a delightful dinner to come home to. I'm talking about this one, for the record. Combine all ingredients and stir until it's a little rough. Kneed the dough with your hands for about 10 minutes until it's a nice, smooth ball. Take a stick of butter and wipe down the inside of a plastic or wooden bowl. If you'd rather, you can wipe the inside of the bowl with olive oil using a basting brush. It's important to use anything except a metal bowl because it's hard to keep it warm, which is the whole goal. Cover the bowl with a kitchen towel for 2-3 hours. By then, the dough should have about doubled in size. Cut the dough into about 4 miniature sourdough balls and smooth out until they're nice and satiny. Set them on a baking sheet or stone and cover again with a kitchen towel. Let them sit for another 2 hours, and they'll get nice and big again. 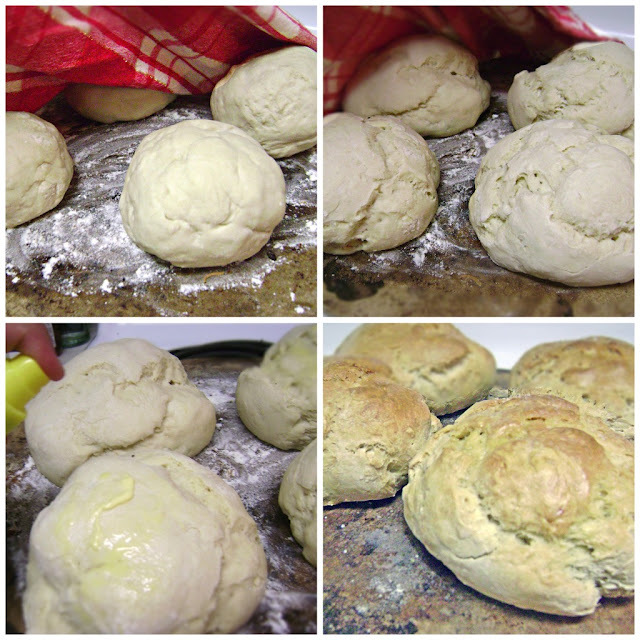 Spray/spread some butter onto the rolls. Not too much; just enough to give 'em a nice, golden "glow." Bake at 400 degrees for 30-40 minutes. Every oven is different, so baking time varies. There are times when I have to turn the heat down and let it cook longer at a lower temperature. Remember, just because the outside is browned doesn't mean the inside is done. Once they're done baking and have cooled, grab one of the bread bowls, set it on it's side, and using a bread knife, cut off the very top portion. Hold onto it, though! If this step confuses you, imagine you're carving a pumpkin. On that note...grab a big spoon and gut the inside of the bread bowl. You may throw the bread away or save it for another project. Pour some potato soup, broccoli cheese soup or chili in the bowl and replace with the top. Serve while soup is still hot. I know it seems like a lot of work, but once you've done this once or twice, it flows very quickly and easily. And the thing I love about this recipe is that I literally have everything I need to make this meal in my pantry. At the end of the month when I realize I've already spent all of my grocery budget, I pull this out. Have I mentioned this is a perfect fall or winter meal? And have I mentioned that it's almost fall, then winter comes shortly after that? Also, I love fall. And winter. 118 days until Christmas!